ANAHEIM, Calif. — Mike Trout tried his best to be the hero Tuesday night. The Angels star hit a two-run homer to tie the game in the bottom of the ninth to force extra innings. In the bottom of the 11th, representing the tying run again, he legged out an infield single, stole second base, and advanced to third on a Raul Ibanez groundout to first, but he never made it home. Of the 34,887 in attendance, there were probably some Angels fans who questioned: can he pitch, too? 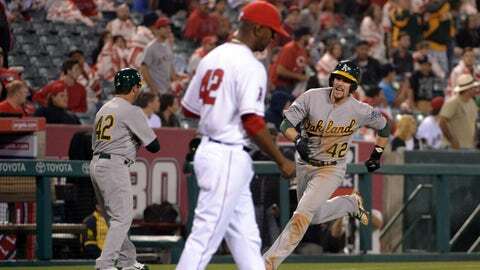 Trout’s attempts at heroism weren’t enough as the Angels fell 10-9 to the A’s in 11 innings. For the second consecutive night, the Angels held a one-run lead, late in the game, only to have the back end of their bullpen squander it. Monday night, it was Ernesto Frieri blowing the save. Tuesday, Frieri didn’t have an opportunity to save the game due to setup man Joe Smith being unable to hold the lead in front of him. Entering the game in the eighth inning and the Angels holding on to a 6-5 lead, Smith gave up three singles and two walks to the five hitters he faced and was responsible for all four runs the A’s scored in the inning to take a 9-6 lead. Smith didn’t record an out. "It’s, obviously, disappointing when you’re not holding leads and we have to do a better job of that," Angels manager Mike Scioscia said. It was an appearance very uncharacteristic of Smith, who entered the night having allowed just three hits and no runs in six appearances. "I was horrible (tonight)," Smith said. "I fell behind in counts. I had the first guy 0-2 and walked him. That’s horrible. Obviously, that’s a no-no. I was absolutely terrible tonight. There’s no other way to say it." Trout was able to tie the game following Smith’s rough outing but in the 11th, Oakland regained the lead for good on a Josh Donaldson RBI double off of Angels reliever Yoslan Herrera. It was not only the second straight night the Angels squandered a late lead to the reigning two-time AL West champs, it may prove to be even more significant. Before Trout’s infield single in the 11th, Kole Calhoun led off the inning by grounding out to second. 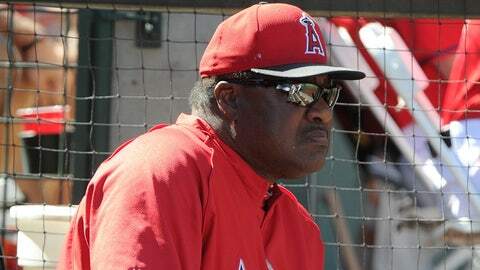 While running out the play, Calhoun ran into a divot and turned his ankle, Scioscia said. 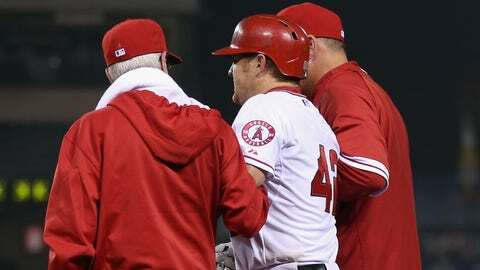 The Angels skipper said Calhoun is likely headed to the DL with the injury. Calhoun walked through the Angels clubhouse on crutches following the loss and was slightly more optimistic. "I think it’s disappointing," said Calhoun, who was 3 for 6 on the night with a home run and three runs scored. "Nothing’s solidified right now but we’ll see what happens."